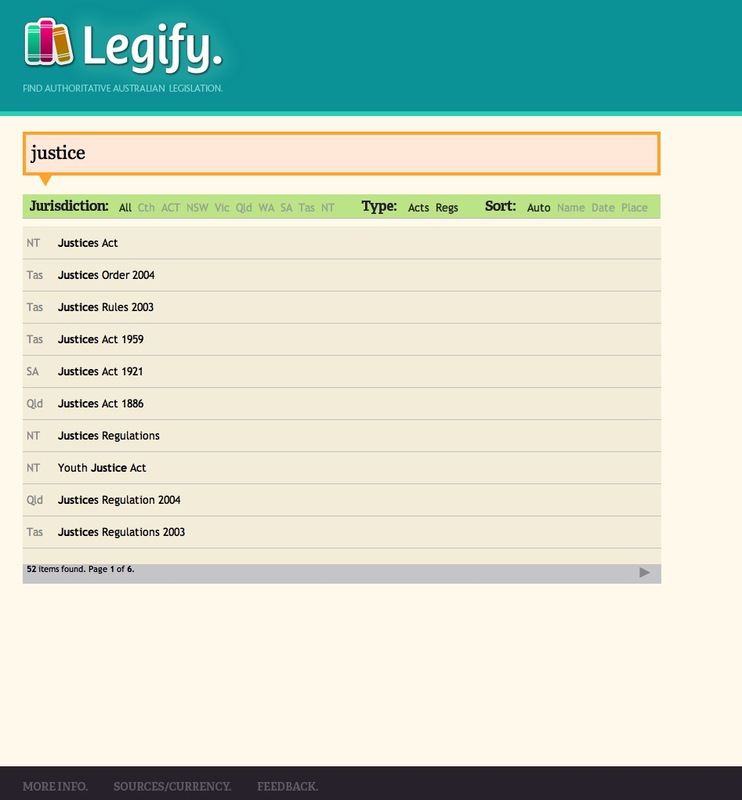 Legify.com.au is a legislation search tool that finds current government versions of legislation in every state. It searches only through titles, but makes comparative research pretty easy. 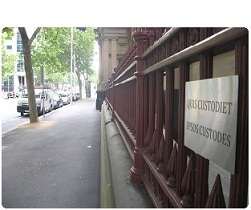 Looking for legislation in other states dealing with criminal procedure? 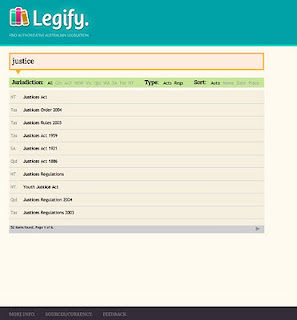 Search under 'justice' for Justices Acts; 'procedure' for procedure acts; etc. It links instantly to the government sites, saving trouble of even finding them in the first place. Great tool. Strangely anonymous. Who runs it? The article on Legal Practice Intelligence says it's a former lawyer named Stephen Tang (which matches the whois result for the domain). Haven't heard of him, but he's provided a mighty useful service! Legify was created by Stephen Tang, a former lawyer and now a legal researcher, registered psychologist and PhD candidate. Developing websites is an excellent form of procrastination. First use is disappointing - it can't be too up to date as it didn't find ice pipes in Vic DPCSA, but it also maybe operator error. PS I'm being anon as at work and have soooo many hurdles to log onto anything other than work! PS Hi ya Kyle. Update to previous - my bad. Now I see it only searches Titles.